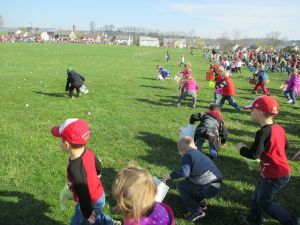 Children sprint from the starting line to gather eggs at Grace Church in Lititz on Saturday. Numerous Grace Brethren congregations held outreach events in the form of Easter egg hunts or cookouts over the weekend. Here’s one that was covered by the local newspaper. Warwick News, a partner of LancasterOnline, reported on the Easter egg hunt at Grace Church, Lititz, Pa. (Ivanildo Trandade, pastor). A portion of the story appears below. Click here to read the complete article. Click on the GraceConnect Facebook page to see photos from similar events at Grace Brethren churches in North America. It was an excellent day for an Easter egg hunt in Lititz on Saturday. Or would that be an “egg-cellent” day? The sun was shining, skies were blue and hundreds of children, from those barely walking to fourth- and fifth-graders, were lined up to hunt for Easter eggs at Grace Church on West Lincoln Avenue. The Easter Bunny was there, posing for pictures. But he was too busy with photo opps to deliver the Easter eggs. Instead, a helicopter hovered overhead and dropped some 4,000 filled plastic eggs to the ground. There were already about 8,000 eggs on the ground, placed there earlier by Easter Bunny helpers. As soon as the helicopter made its egg drop and began to fly away, the children pounced.